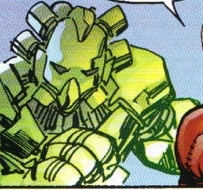 Tech-Head was one of the new breed of villains that was inducted into the Vicious Circle during its reformation by SkullFace. He participated in the battle that took place at Gaylord Manor when Dragon led an army of heroes to rescue Angel Dragon from captivity. Tech-Head remains in service to the Vicious Circle and was part of the unit assigned to serve Dart II when she held Malcolm and Angel Dragon captive.